According to the Environmental Protection Agency, people in the United States use more than one billion syringes, needles and lancets each year to take care of their diabetes. In addition, more citizens are finding used syringes and needles lying around their neighborhoods which may pose medical risks to anyone who stumbles upon them. Improper disposal of syringes, needles and lancets have become a serious threat to our environment, citizens and garbage workers. It is important for everyone to know how to safely dispose of these types of medical waste to keep our communities safe. FDBD Paramedics are exposed to syringes, needles and lancets every day in the course of their work. Due to the added risk to our Paramedics, the FDBD does not pick up, collect or act as a disposal center for used syringes and other medical waste. This policy is in accordance with similar national policies, including local policies now in effect at the Northern Kentucky Health Department and other local fire departments that also refuse to accept such items due to the risk presented to their employees. If a syringe is found in your neighborhood, do not touch the needle. It is recommended that syringes be picked up using pliers, tongs or other similar tools. Heavy leather or canvas gloves can also be worn when picking up a syringe. 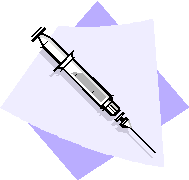 Place the syringe in a rigid, puncture-proof container and place it in your garbage can. The container should have a tight-fitting closure or lid. Containers should not be glass because they can break in the garbage can. Good containers to use are a coffee can with a tight-fitting snap lid or a heavy-duty plastic milk or bleach jug with a screw-on lid. The lid or closure should also then be secured with strong tape as an added preventive measure for garbage collectors and others who may go through your garbage can. If you are a diabetic, having a plastic or tin container to drop your syringes in can be stored in a location out of the way of children and used until the container is full. Be sure to tape the lid on your container before tossing it into the garbage.